And now for the optional stuff! In all the time you've spent wandering about Lorule, you've probably wondered at least once what the Sanctuary is like in Lorule. You don't have to visit it at any point, but it's certainly worth the trip to the Graveyard. You may also want to take a gander at Zora's Domain in everyone's favourite extra-dimensional land, and this article will cover those grounds too. - You spend so much time looking for cracks between dimensions in the outdoors that you may have trouble finding the crack leading to Lorule's Sanctuary. It's cleverly hidden, in fact, as it's inside Sanctuary, on the northern wall. Dive on in. 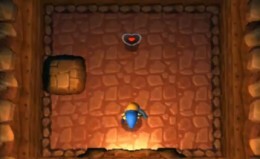 - You'll come out in a cavern, with the alternate version of Hyrule's priest nearby. Light the brazier for some extra dialogue, then leave to the south. - You'll emerge outside. To your immediate left as you emerge on the world map is a large stone; toss it aside to find a Maiamai. - Walk east. The graveyard of Hyrule is a weird garden in Lorule. Start by checking the cliff wall north of the plot of land; here you'll find a Maiamai. - Ascend the cliff and blow up the Bombable spot above to find a crack between worlds. Slip through into Hyrule and you'll find a cave. Inside is a Heart Container. Grab it, then merge with the wall outside to slide left. You can pry a Maiamai free here. - Activate the weather vane in the Graveyard. - Leave and carry on east one screen. At the end of this path you'll find a tree, which you can bash to find a Maiamai, and beyond that a chest containing 100 rupees. - Return to the Graveyard. Pluck the stone away from the conspicuous area in the northeast of the Graveyard to find stairs. Downward we go. - Look familiar? Straight ahead is a treasure chest containing one rupee. Wooooo. Clear the skulls to the northwest away to find a button which will open the path ahead. - Yep, preeeeeetty similar. Walk west through the dark and, on the way to the far wall, you'll find a chest containing five rupees. Double wooooo. Climb the stairs at the far end and head back east along the walkway; merge with the wall once you reach the chest with 20 rupees and continue east to find a Small Key in a wall niche. Use it on the locked door in the west. - Beyond are three stone cyclopses. Kill 'em. Easy by now, so long as you don't freak out and move around too much. - In the next room there are two switches. The left one drops snakes on the area; the right opens the northern door. - Back in the Sanctuary, such as it is. Merge with the wall and go south to find a big chest. Inside is Master Ore. Eeeexcellent. That's all for the Graveyard. How 'bout Zora's Domain? How's that place faring in this gloomy world? Reaching Zora's Domain in Lorule is less confusing than the Sanctuary. Fly to the Witch's House and head east, sticking close to the cliff wall. The crack is in a small pit. - Walk north from where you pop out and go west one screen. Sitting at the edge of a waterfall, which itself empties into a chasm, is a Maiamai. You'll have to hop down to collect it, then swim back east before being swept to your doom. - Merge with the wall outside and travel east. 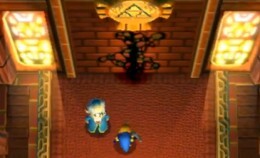 You don't have much choice - you'll have to backtrack through Hyrule to reach Zora's Domain again. - Climb the ladder northwest of the crack in the wall. Merge with the wall and travel south until you come to a plateau covered in grass. Chop at the grass to find a Maiamai. - Continue eastbound. On the next screen you'll find a waterfall. The area is filled with enemies. Kill them all (projectiles besides the Fire Rod are real handy) to receive 100 rupees. Before you leave, dive into the water to the southwest of the waterfall to find a Maiamai. And... that's... it! Fun, wasn't it?